This article will help you to track your Android phone online and guide you to locate lost Android phone. It is easier than ever to track down your lost phone; you just prepare your phone for loss by setting up the best app for phone tracking. 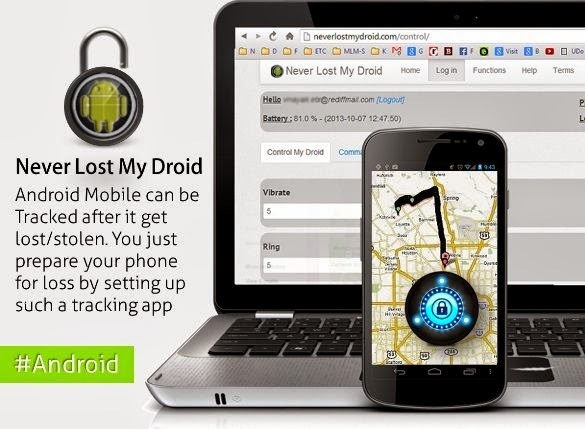 Never Lost My Droid is a FREE application which allows you to recover your lost or stolen phone. 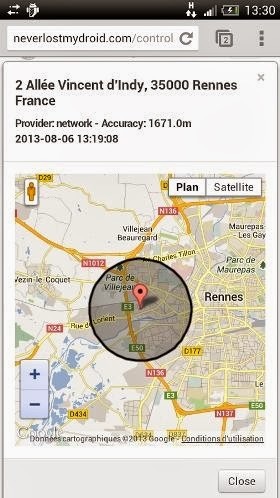 Locate your Android device directly on a map with this app. You don't need to find mobile number locator to track the location of mobile number you lost. You can track by GPS, SMS, Call logs or SIM info. This is one of the best apps for tracking phone. You can track your registered phones free. Install and gets start to track the phone. Basically Android doesn't come with in-built tracking feature other than Samsung security account and makes it lack behind in its advantages and its features are gets so much limited. So there is no official way to track your phone if you lose it. Never Lost My Droid app tool is reliable android tracking spyware to track all your activities including SMS, calls, location, pictures and much more. When the Android phone get stolen/lost or even you want to track your mobile activities; this app comes to help you wisely. It's a best GPS tracking app. Not only in loss or stolen cases, suppose if you lost your phone at home and you want to see your missed calls or text messages Never Lost My Droid app can serve you those features for FREE. Today we are going to learn about new & advanced tracking application available for your Android phone. It's a free application that allows you to recover your lost or stolen phone. Let's find out more about its advanced features. The latest GPS tracking technology track your phone remotely with real time location updates. This Android tracking app tool lets you read all text messages sent or received by the target phone user remotely. This proves its a best text tracking app. This app Allows you to remotely view all incoming/outgoing calls with their duration and timestamps. You can remotely record audio to find out what's going on around the phone. This feature allows you to lock your phone activities remotely by 4 digit code, which can be used to unlock once you got your cell in your hand. Once you install this app, you can hide its icon to avoid intruder interface. Send a message and voice message. Find phone by making it ring. Find phone using GPS location. 100% Free, no hidden charges. Hide from launcher (Name : Service GPS). Command by SMS (Enabled Data Mobile/GPS/WiFi ...).